2295, Used Rims, 18X7-1/2, 5 LUG, 4-1/2", 07-09, DODGE, CHARGER, MAGNUM, 5 SPOKE, CHROME CLAD. 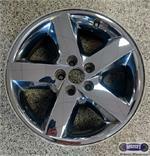 2304, Used Rims, 20X7-1/2, 5 LUG, 4-1/2", 07-11, DODGE, NITRO, 5 DOUBLE SPOKES, CHROME CLAD. 2310, Used Rims, 18X7, 5 LUG, 115mm, 08-10, DODGE, AVENGER, OPT WPL, CHROME CLAD, 5 SPOKE, ALLOY. 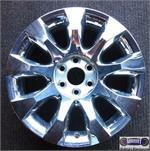 3195b, Used Rims, 16X7, 5 LUG, 35MM, 97-00, FORD, F-150, EXPEDITION, CHROME CLAD STEEL. 12MM WHEEL BOLTS MAY BE STAMPED 14MM INSET. 3659, Used Rims, 20X8-1/2, 6 LUG, 135MM, 07-09, FORD, EXPEDITION, KING RANCH, 6 SPOKE, CHROME CLAD, ALLOY. 3680, Used Rims, 17X7, 5 LUG, 4-1/2", 08-09, FORD, ESCAPE, VOGA, EXCEPT HYBRID, CHROME CLAD, 5 WIDE ROUNDED SPOKE. CENTER CAPS HAVE A = FORD, B=VOGA. 3819, Used Rims, 19X8, 5 LUG, 4-1/2, 10, FORD, TAURUS, 10 SPOKE, CHROME CLAD, ALLOY. 6579, Used Rims, 17X6-1/2, 5 LUG, 115 MM, 05, PONTIAC, MONTANA, SV6, OPT P23, 5 SPOKE, CHROME CLAD FINISH, ALLOY. 6625, Used Rims, 17X7, 5 LUG, 110mm, 05-09, CHEV, PONTIAC, G6, MALIBU, OPT PA2, OPT PFE, 5 SPOKE, CHROME CLAD FINISH, ALLOY.